My latest article Flasbak looks back at the electronic toy craze of the late seventies. Today, we have iPhone apps and video game consoles…and thank goodness for them. But when I was a kid in the l970s -- a long, long time ago -- the home video game market was only in its infancy, and another kind of toy ruled the market instead: the “electronic” toy. 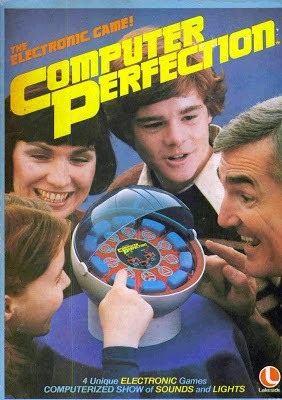 This was the era of Quiz Whiz, Simon, BLIP, and the first Electronic Battleship (1977). These and other electronic toys seemed incredibly futuristic at the time with their light-up indicators, keypads, and buzzing sound effects. Today, of course -- over three decades later -- these toys would hardly pass muster with any eight year old. And yet the following five electronic toys I still remember with incredible fondness. Indeed, they all have prominent real-estate in my home office to this day." My cousin in West Virginia had a Merlin. I remember trying to recreate the Munsters theme with music machine. I wasn't entirely successful.